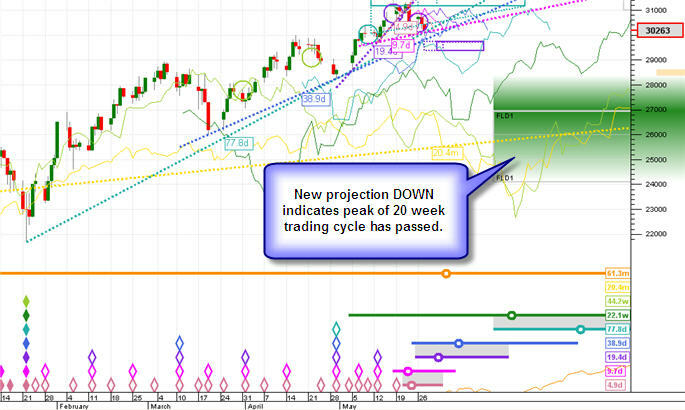 The software indicates that the 46.1 week cycle formed a trough a week ago, on the 22nd of January. This is the nominal 9 month cycle, so we can now expect 2 x 20-week cycles, with the peak of the next 9-month cycle most likely occurring in the FIRST of these sub-cycles because the short-term underlying trend of the 9 month cycle is DOWN (18-month turning down, 54-month down). This is therefore a good time to buy as we expect a 9-month magnitude peak within the next 20 weeks (the software targets the 25th of April). The target for a long trade is given as 30500 (the middle of the red sell-zone on the chart), and the expected exit date for the trade is between mid-April and late-May. The stoploss level is set a small distance below the most recent low (of 21932) at 21750. Between here and the target there are two Pause Zones (the sandy coloured background boxes), so the price is likely to pause in those areas on its way to the target. 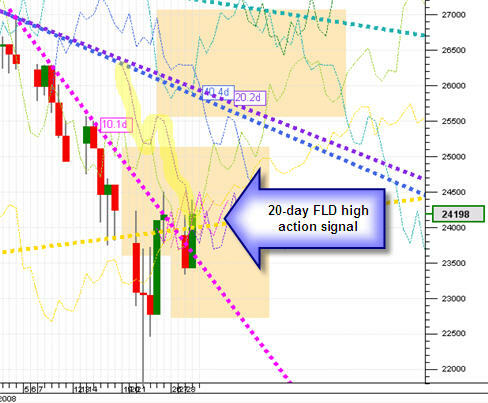 There are several FLD’s in cascade position, which will project price upwards. 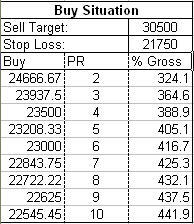 This gives us the following buy situation, which indicates a Potential to Risk ratio of 2 at a price of 24666. I would prefer a higher PR ratio (of 3 – 3 1/2), but given the high confidence rating of the phasing at this point (not shown), and the extreme nature of the recent trough indicating probable fundamental interaction on the day of 22nd January – which is a typical “panic bottom” occurrence – also called a spike, or key-reversal day, (note that day’s candle’s long lower tail, or shadow) – I will go ahead with the trade, particularly as the gross% profit to be made is very satisfactory at over 300%. In fact the entry occurs fairly near the high of the day, and the trading for the day closes slightly below my entry, but there is no cause for alarm! The trade progresses very well, with all the cyclic events falling into place as expected, including a pause/correction in the pause zone identified between 26000 and 27000 – which because it was expected gave no cause for alarm. We’ll jump forward now to the 28th of May. 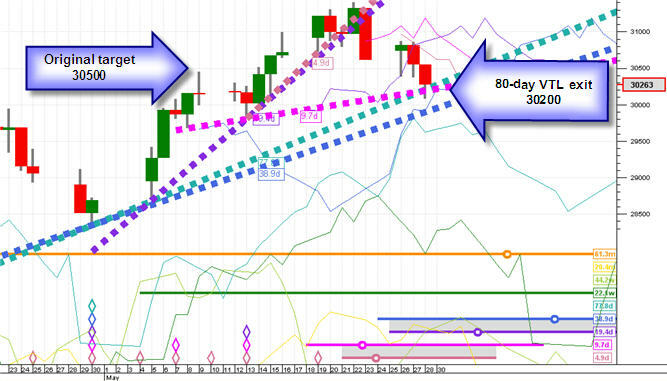 The software two days ago identified the peak of the 20-week cycle (which is the cycle we are trading) as having occurred on the 22nd of May. 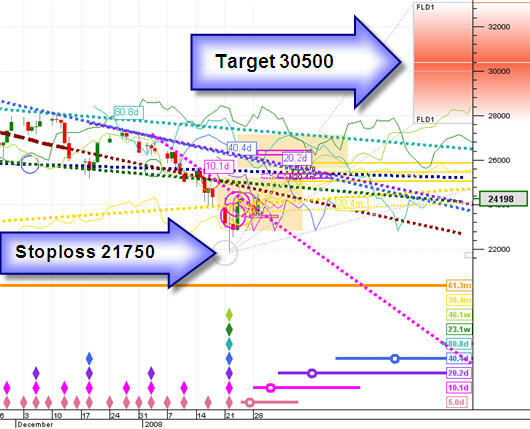 It is now projecting DOWN to a new target somewhere below 27000. If we had exited at our original target of 30500 (assuming that no better-than-expected signal had been received), then our exit would have been effected on the 14th of May, however assuming that we canceled that exit (ignoring the software, and hoping for more upside), an action signal at the crossing of the 80-day VTL (confirming the 20-week peak) would have taken us out on the 28th of May at 30200.